Once the darling of miners, the Canadian province of Quebec appears to have lost its edge, as a consequence of mounting uncertainty over protected areas and environmental restrictions, as well as increased regulation and tax changes, concludes a new study published Thursday by the Fraser Institute. The province that ranked first worldwide from 2007 to 2010 as a desired mining destination, barely reached the 11th place out of 96 jurisdictions this year, as an earlier report from the same leading public policy think-tank revealed. In 2012, Quebec was fifth. “Falling from No. 1 to 11th in just three years tells us that the mining policies of the Quebec government are a serious concern to the global mining community,” said then Kenneth Green, Fraser Institute senior director of energy and natural resources and director of the survey. Fast-forward 10 months and Canada's largest province by area continues the downward trend, the study shows. According to Quebec’s Mining Policy Performance: Greater Uncertainty and Lost Advantage, there are four key barriers to investment in Quebec: ambiguity regarding protected areas and environmental regulations, taxation, and regulatory duplication and inconsistencies. Each of these issues, warns the report, have significant potential impacts to the province. “When a jurisdiction loses mining investment, it loses jobs for skilled workers, wealth that goes along with those jobs, and the subsequent government revenue,” explains Green. 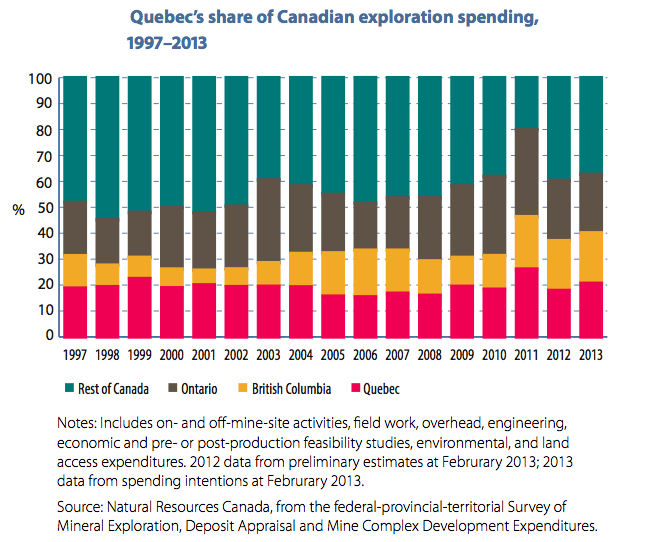 He adds that if Quebec wants to prevent further decline and recapture its status as a top global mining jurisdiction, the provincial government needs to reconsider its mining policies. Investors doesn’t know what to expect in terms wilderness zones, parks and archaeological sites in Quebec, as the province has changed its stance several times, the report says. 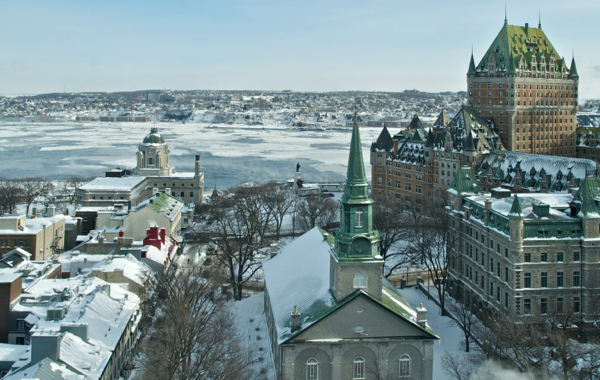 These modifications include commitments to protect 12% of Quebec’s northern territory (nearly 1.2 million square kilometres) and intentions to exclude up to half of the territory from industrial use. “Uncertainty in environmental regulations deters investment by threatening projects with new restrictions and prohibitions, creating the perception that special interests— rather than sound science—guide policy decisions,” Green says. Since 2010, Quebec has introduced two major changes in taxation—increasing mining duty rates by 4% to 16% of annual profits, and basing profits on individual mines rather than across operations held by a single owner. Now, losses incurred at one mine can’t be used to reduce annual profits at another. “With its increases in mining taxes, the Quebec government runs the risk of setting a tax level so high that mines become unprofitable,” says Alana Wilson, study author and senior economist with the Fraser Institute’s Centre for Natural Resources. According to the report, regulatory duplication and inconsistency has increased steadily over the past five years despite the recent defeat of Bill 43, the third mining reform to be killed in close to four years, which would have created more layers of regulation. The Fraser Institute is not the only institution alerting both Quebec and investors about existing challenges. 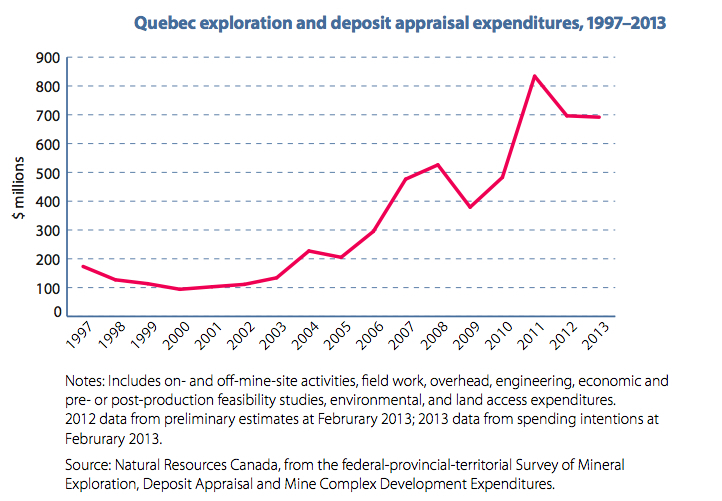 Recent surveys of mining executives conducted by the Institut de la Statistique du Québec point to a nearly 10% decrease in mining investment in the province this year, to a little over $4.6-billion. The figure represents the first decline for Canada’s top destination for mining investments in more than a decade, after a record 2012. And while 2013 will remain a good year by historical standards, the slide will likely continue, with a 28% drop in exploration spending expected to follow the already steep 26% of 2012.